Under its open data policy, the Queensland Government yesterday released a very interesting data set on criminal offences on a monthly basis since July 1997. Recalling the work of Nobel laureate Gary Becker on the economic determinants of crime, I prepared this quick chart to see if Queensland’s higher unemployment rate since the 2008 financial crisis has affected the crime rate (offences per 100,000 people). I restricted the analysis to robbery, unlawful entry with intent, unlawful use of a motor vehicle and other theft because I considered these offences to be the ones most likely influenced by economic conditions. I’ve labelled these offences robbery, burglary and theft on the chart below. 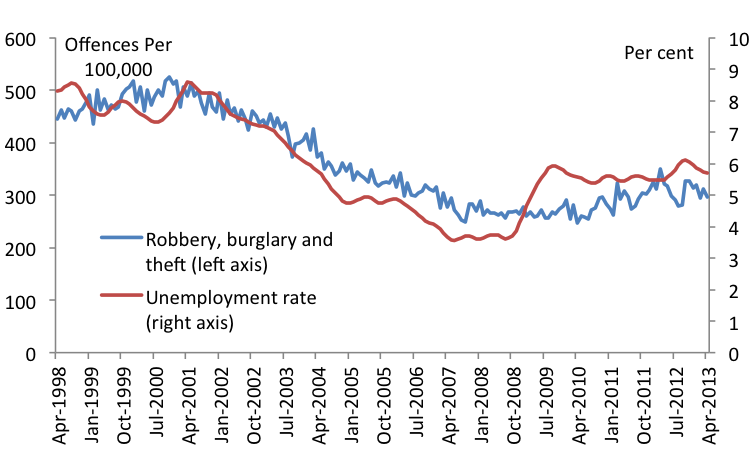 Eyeballing the data, it’s possible higher unemployment has led to a slight pick up in crime since the financial crisis. Of course, it would be desirable to undertake a more rigorous statistical analysis. This analysis would need to account for demographic change, particularly the falling population share of young people, who commit a disproportionate number of offences. I hope some keen researcher out there picks up this fascinating new data set. This entry was posted in Crime, Labour market and tagged crime, queensland, unemploymentrate. Bookmark the permalink. 2 Responses to Did the financial crisis lead to an increase in Queensland’s crime rate? Hi, really interesting observations. I guess the difficutlies with the ABS unemployment figures is that underemployment is still classed as employment and if financial stress is a crime motivator, then you might need to understand the pattern of underemployment too. Then there’s the lag issue (i.e. time between loss of employment and when the $ runs out – but for some this would be quick). Roy Morgan puts these two things together – but they only have national data……. Thanks Chris. Yes, it would be important to consider the impact of underemployment and financial stress as well.